HI NEW WALL! Nice potential, you’ve got there. First, we’ve collectively decided to make this a restful moment so there will be no fixtures, no electric switches and no furniture against the wall — it’s purely reserved for art and the kind of art we pick will set the mood for the room. Idea #1: A series of 12 graphic, black + white prints by Luce Meunier. While this makes my minimalist heart sing, I’m aware that it’s a bold look. Together these prints would fill the wall and be THE major visual of that corner. Favorite part: the subtle layered blurry edges in each one of these that’s really only appreciated up close. Idea #2: Modernist painting by Kristina Burda. Yes, this still speaks to my inner minimalist, but this muted color palette and single piece has a very different impact; it feels calm and serene. I also love how the painting has a crisp composition and smooth layered surface texture that you don’t get from the digital image, BUT it’s there and this kind of detail really softens a room. And I’m into the scandi-vibe for the rest of the room; clean, modern, fresh lines but still lots of personality in this space. Idea #3: Abstract painting by Melanie Authier. Here we have more color and more energy. The palette is still soft so it feels totally livable, while the layers of shapes and textures create a more intense sense of depth. Like the Meunier’s, this would draw your eye straight to the artwork when you enter the space. Plus, the natural light that comes pouring through the sliding doors would play off it nicely, and there’s no reflection or durability issue since this is made of acrylic on canvas. Maybe it’s the snow (come on, Spring! 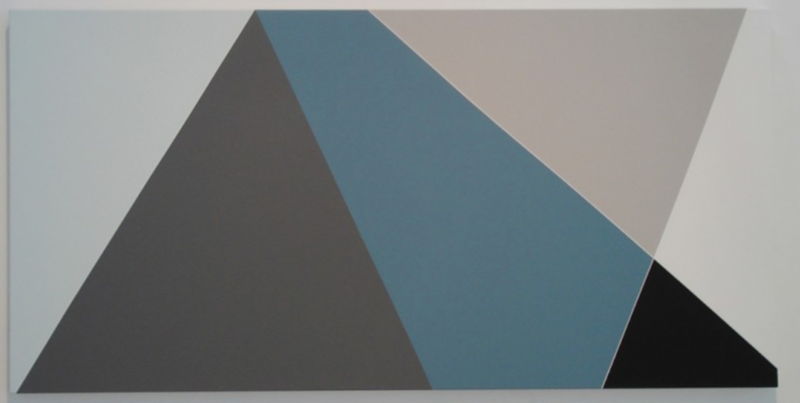 ), but I’m also feeling this minimal, textured piece by Alexander Jowett. The texture comes from the mix of materials - acrylic, stitching and mud cloth on raw linen. It’s subtle but those kinds of details bring me so much joy, and it could coexist nicely with richer fabrics, and maybe even a complementary sculpture in the corner. These scenarios are ridiculously amusing to play out, and they inform SO many other choices that the build team makes - together! Props for collaboration and working towards a shared end goal. Oh and WHICH IS YOUR FAVORITE?? Votes welcome since the jury’s still out!